happyaspie | I believe in food. Welcome to Happyaspie! I'm Emily, an aspiring Registered Dietician with a lifelong love of real food and healthy living. Enjoy! Add HAP to your feed! For the past few months I’ve been battling a nasty case of lumbar radiculopathy. Seriously. I could not make this up. Ok, really, it’s just sciatica but it sounds so much ridiculous (har har) when I use the medical term! While I plan to write more on how I’ve dealt with being unable to run, bike, lift, or really do anything that used to be part of my everyday life, for now I’ll just say that Saturday’s run was not the glorious return to the sport that I had hoped for. It left me feeling washed out and achy and my back and leg pain returned with a vengeance on Sunday. I was…frustrated, to put things mildly. The only thing that managed to brighten my mood? Discovering that we had FOUR black bananas rotting away on the counter and a beautiful box of blueberries waiting in the fridge. 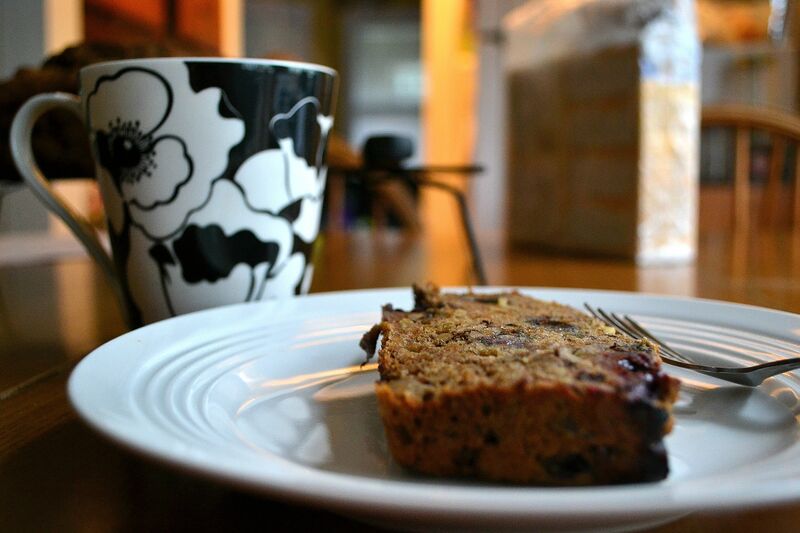 When life gives you sciatica, you’ve just gotta make some banana bread. That’s totally a saying, right? Who’s with me?! I’ve always stuck by Tyler Florence’s recipe for Banana Bread with Pecans as a guide for proportions, opting for oil instead of butter, always using whole grains, and typically halving the sugar. This time around I went even more in my own direction but I have to give T. Flo a nod for sending me down the right path! 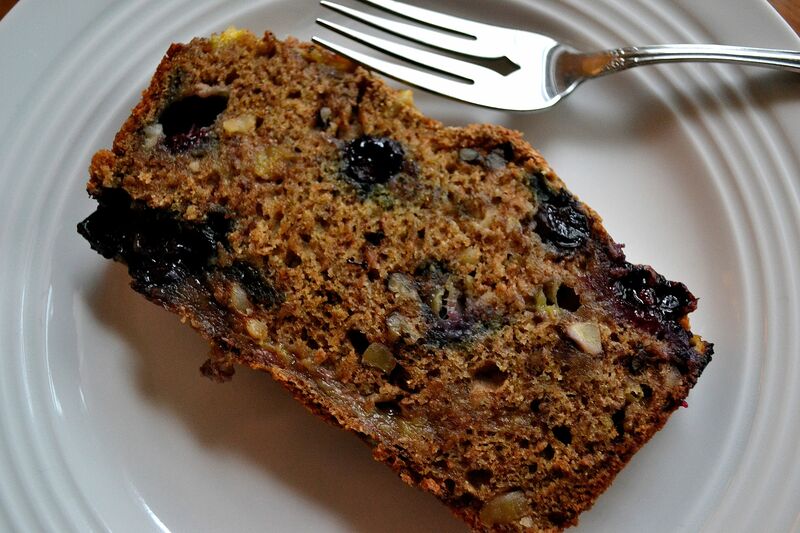 This bread is loaded with all kinds of goodies – mashed bananas, plump, fresh blueberries, and chopped walnuts. These last three ingredients are folded into the batter at the end to preserve the integrity of the fruit and it look ever ounce of self-restraint not to just dip my spoon into the bowl! Honestly, I’m not sure why I didn’t. You totally should and then tell me how awesome it was. This bread is elevated onto an entirely different level by the addition of buttermilk. Oh, yes, buttermilk. We never have it around so I typically make my own. 1 cup of milk (any kind, even non-dairy) plus 1 tablespoon of white vinegar, apple cider vinegar, or lemon juice and BAM, in about 10 minutes you have homemade buttermilk. I used the real stuff this time around since it was already opened and ready to go but I swear by the homemade variety. It never lets me down! While tart and tangy, it makes any recipe feel decadent by making the batter velvety and soft. I love it in bran muffins and other quick breads but prefer it most in pancakes. It’s a (nearly)vegan baker’s secret weapon, for sure! Preheat the oven to 350. Oil and flour a 9×5 inch loaf pan. In a small bowl, mash two of the bananas until they are soft and chunky. With an electric mixer, blend the sugar and 2 remaining bananas until light and fluffy. Add the milk, vanilla, and flax eggs and mix until smooth. Add in the dry ingredients and mix until just combined. 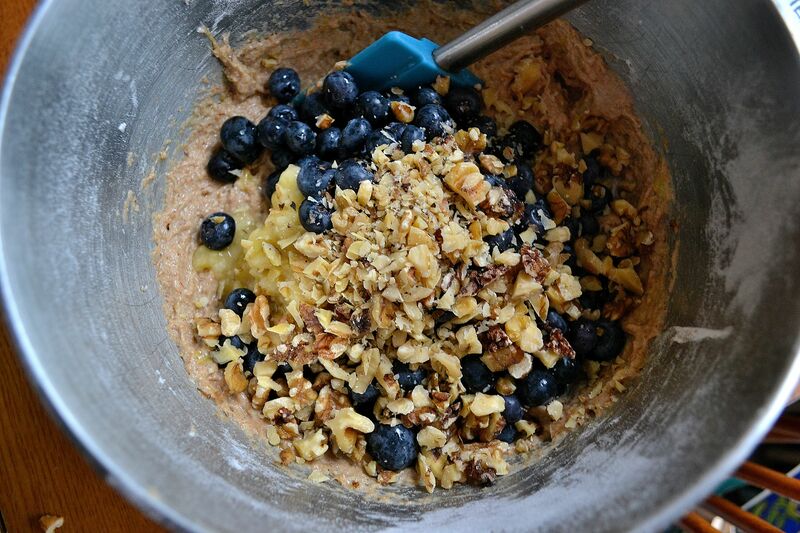 Gently fold in the mashed bananas, blueberries, and walnuts. Bake for 50 minutes* and check. The top of the bread should be golden brown (it’s okay if there is a crack down the center) and a knife inserted into the center should come out clean. * My oven is very aggressive and bakes things far too quickly. Your bread may require an hour to an hour and 15 minutes. While my back may still be giving me a hard time, it’s hard to not feel like life is jusssst fine when there’s warm bread on my table, a cup of tea brewing, and a great Kindle read waiting for me. This past long weekend was a whirlwind – spring cleaning, gardening (more on that later! ), catching up with friends, cheering for the marathon runners. It was also the hottest weekend we’ve had since August, bringing about cravings that don’t normally hit until mid-July. I found myself waking up with strawberry-banana smoothies on the brain and spent every evening on my back deck, a cold Grey Lady in hand. Typically, my summertime cravings for anything cold and juicy (enter giant bowls of watermelon and popsicles for dinner) lead to an all-out aversion to any sort of food prep. As soon as I walk into my inferno of an apartment, any desire I had to turn on the oven washes right out of me. Luckily, our apartment managed to stay spring-like in temperature this weekend and fueled my drive to flip through my cookbooks and find the perfect salad. It is rare for me to stick to a recipe. Usually, a recipe is used more as a flavor and proportion guideline. I find myself trading certain ingredients for those that are more appealing to my palate or, more likely, for what I already have in my pantry. Time and again, though, I have found that there is very little that I want to change in Heidi’s recipes. Super Natural Everyday has become an essential part of my kitchen and is a fabulous way to pull yourself out of a food rut. The photograph alone for Heidi’s Mostly Not Potato Salad was enough to push me out the door to TJ’s, in search of leeks and whole-grain mustard. While this dish does require a bit more prep time than, say, your typical green dinner salad, it came together in under 30 minutes and I hardly broke a sweat. With this salad, I only took liberties with the actual size of some of the veggies (shortcuts are the only way to go sometimes!) and, without chives available in my kitchen, turned to thinly sliced green onions instead.The perfect salad showcases something soft and something crunchy, as well as a beautiful marriage of sweetness, acidity, and saltiness. Heidi’s potato salad? Perfection. Bring a medium pot of water to a rolling boil. Add the potatoes and cook for 10 minutes, or until just fork tender. 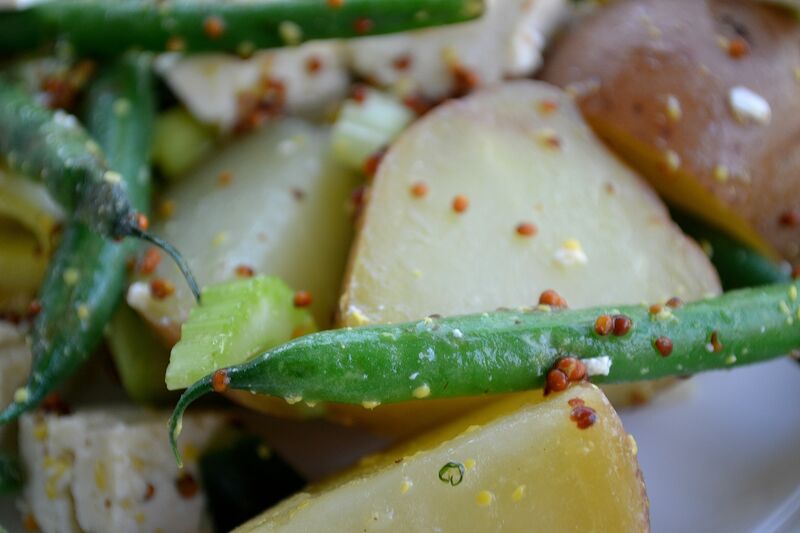 30 seconds before the potatoes are finished, add the green beans. Drain and set aside. Meanwhile, whisk together the following: mustard, vinegar, olive oil, sugar, and sea salt. Set aside. 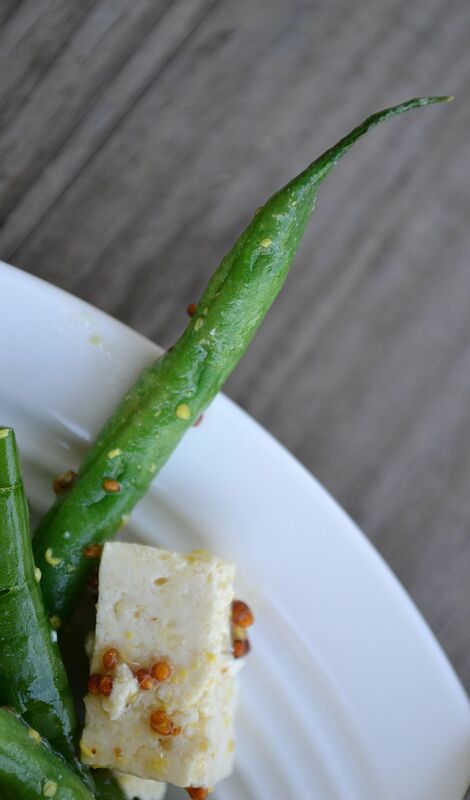 In a small non-stick pan, heat about a teaspoon of olive oil over a medium flame and add the chopped dill. Saute until fragrant, then add the chopped leeks and cook for about 5 minutes until just golden. 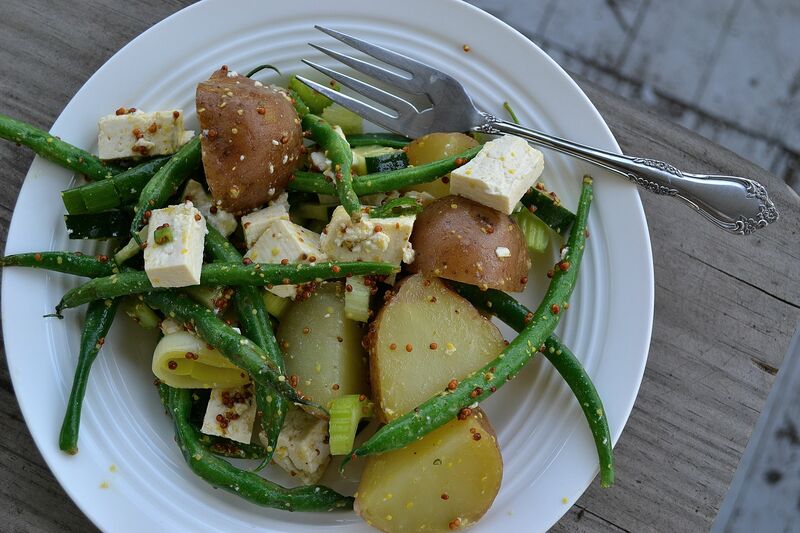 In a large bowl, gently toss the potatoes, green beans, leeks, celery, cucumber, tofu, green onions, and dressing. This salad was delicious slightly warm but was even better the next day after being chilled overnight.